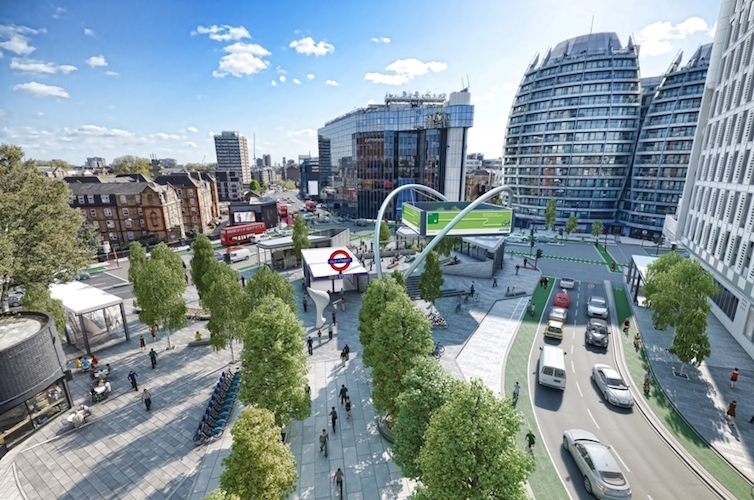 Four years after consulting on plans to reconfigure the ugly old Old Street roundabout – or Silicon Roundabout, as it had by then become known – the start of work on the project has been announced. The evolution of the scheme has been interesting for the issues it has addressed, the influence of interest groups and the tensions between them it has revealed. Going back to 2014, we find expression of what is now the familiar opposition to a familiar symptom of London’s relentless growth – a rising demand for and cost of property. The Silicon Roundabout nickname was coined in recognition of the cluster of new technology start-ups in the area. Soon came the complaint that “small weird companies in small cheap offices” that sometimes do brilliant things were being “priced out” to make way for “luxury flats”. Hackney Council was glibly accused of being eagerly complicit in this, prompting a strong defence from its cabinet member for regeneration. The consultation produced further illuminations. The roundabout plans were presented by Transport for London as fundamentally concerned with making the streets more agreeable for pedestrians and for cyclists, whose numbers in the roundabout’s vicinity are strikingly large during commuting periods. TfL says that over 1,300 responses were received from across Greater London, the majority in the roundabout’s general area. London cycling activists, overwhelmingly young and concentrated in socio-economic groups A and B, have the time, inclination and skills to make their presence felt in consultations about re-engineering roads. No surprise, then, that the consultation report shows no less than 749 of those 1,300 respondents identifying themselves as cyclists, of which 685 – 91 per cent – said they believed cycling conditions would be improved. So did 452 respondents who identified themselves as non-cyclists. Cyclists, of course, are almost always pedestrians as well. This might help explain why well over a thousand of the 1,300-odd respondents described themselves as such and why 949 (89 per cent) and said the proposed schemes would improve conditions for them. Over 1,000 of the 1,300 respondents said they were bus and Underground passengers too, of whom two thirds approved of the scheme. Only motorists were unhappy, with 173 of the 401 who responded saying they thought it make things worse for them, compared with only 96 who thought the opposite (the rest didn’t know). Such ringing endorsements from self-defined users of the three “sustainable” transport modes – walking, cycling and public transport – were surely welcome to TfL, though there were also significant misgivings and objections. Along with segregated cycle lanes and crossings, the scheme envisages creating a new, surface level entrance to Old Street Underground station and a “peninsula” public space with the current north-west “arm” of the roundabout being closed to motor traffic and two-way road space being introduced. Caroline Russell, a Green Party councillor in Islington (and these days a London Assembly Member too) would have preferred a completely new “crossroads alignment” at the junction to an adjustment of the roundabout arrangement. Hackney Living Streets agreed and thought the number of traffic lanes should be reduced and that some of the cycle lanes might be too wide. The London Cycling Campaign, however, thought more road space should be allocated to cyclists. Hackney Council complained of loss of pavement space. Russell also wanted to see the huge JC Decaux advertising structure that looms oppressively above one section of the roundabout removed. Alas, TfL and JC Decaux have an agreement for it to stay until 2025. The consultation report gives no clues as to whether it might be removed after that (on a personal note, the sooner that monstrosity is gone, the better). That is just part of the story of TfL’s attempts to negotiate a forward path through this unsatisfactory urban space where the forces of economic and social change, a set of transport objectives that clash in various ways and the varying priorities of different street-user groups have form a tangled spaghetti of a decision-making junction. It’s a bit of an exemplum – go on, look it up – and quite educational. Read the consultation summary here and the consultation report here. London and immigration after Brexit. How should it work?